I had a nice early start to my day today. Put on my coffee and finished feeding the cats. Went back into the kitchen to discover my coffee pot decided to quit. I managed one cup of coffee, so not all is lost. I’ll be interrupting these notes to go to breakfast with a friend. A late birthday outing. That is one long title that @infovore has written. This is the first I’ve seen this mag style approach to a post. Apparently he’s written seven others. I’ll have to check them out sometime soon. @infovore reported on his chat with @gavvet about his observations on the growth of Steemit and what he feels is needed going forward. Then he moved on to talk to @repholder of the RobinHood Whale Project. That is a project developed to try to give a handup to developing contributors on Steemit. An interesting convo between them. I noted his comment about the level of plagiarism on the site. They check all their candidates for it before distributing their links. Their chat channel is one of the places I look when reading. Another one of the channels I check out is Project Curie so I was very interested in the chat with @donkeypong. I noticed the comments about the Trending page. Some thoughts on finding quality writers I hadn’t thought of before. So this link is page 1 of the mag. I’ll cover page 2 later. I have it open in my browser so I’ll get to it. @kyriacos has written 10 suggestions about making Steemit grow. Some of them came to @kyriacos in a dream. Now that is a person absorbed with the platform. I really liked the idea of having a menu section dedicated to “How to Steemit”. Great idea especially for newer users or those wanting to increase their knowledge of the system. I don’t agree with some of the other suggestions but they had started some great discussion. Don’t forget to read discussion on posts, some of the comments add to the content of the post. As mentioned earlier, my friend took me out for breakfast this morning. A very pleasant outing. We went to a cafe in the next town as this community lacks a good place for breakfast. I’d never been to the cafe but it was worth going. Nice and clean, great food, good service and lots of COFFEE! I need to stop at the local hardware on my way to do bar duty to get another coffee maker. Can’t be having tomorrow morning roll around and me without a coffee maker. When we pulled in my driveway when she brought me home, a movement under my car sitting in the driveway caught my attention. A pigeon was sitting under the car. Usually they hang around at the barn on the end of my property, this was odd. I got out of the van and my friend drove away. I stood outside and watched as the pigeon walked out from under the van and made it’s way down the roadway before crossing over to go into the barn. Makes you wonder what moves them. I haven’t read any of @ekitcho’s posts before but this one was interesting. 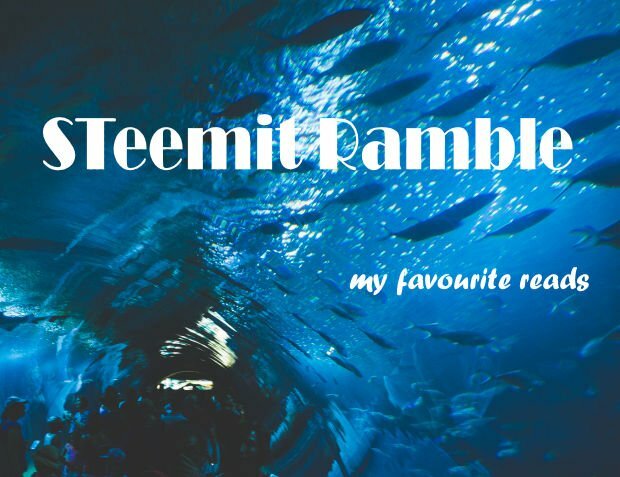 @ekitcho has written a pretty comprehensive analysis of his experience on Steemit today and how he views the platform. I notice that a very in depth discussion has developed on the post so be sure to read both the post and the discussion. @mahma has written a story from her youth about her response to her mother’s boyfriend’s abuse of her mother. A hard life lesson about handling fear in her own life. I’m often amazed at the raw truth that some Steemians are able to write with. I’ve added @mahma to my follow list. @luminousvisions has written a well crafted piece on what is going on around Steemit. He’s linked out to several other articles within the text of the piece. I already have a lineup still to get through but, I did add one of his links to my queue. Now I’m up to 22 links. They become irresistable. Don’t forget to click to at least a few of the pieces from there. @krnel has written an excellent outline of people who bully and create misery for others. Bullying has always been a part of life but it seems that the web and the ability to post with relative anonymous identity has embolden even more moderate bully types. This piece is well worth reading for some understanding of what drives a bully. Never fails to amaze me the creativity that Steemians put into creating tools for the our use. @kurtrohlandt attempted to create a tool to record post views last week. A feature that would really be welcomed by me, but it failed. Well instead of lemons, he created lemonade and repurposed the site into four other neat little tools. Well done @kurtrohlandt.. Check them out, you may be able to put them use. @onetree’s purpose in writing this post was to ask the question: How will Steemit attract young people? That is a very valid question although I have come across several young people writing on the site so it may already have started doing so. Something that caught my attention in the post was her talking about her youngsters and how they address race in South Africa in their generation. During my teen years, it was the presence of apartheid in South Africa that awakened my awareness that racial inequality and the state sponsored discrimination against groups of people didn’t stop with the abolition of slavery in the States or the breaking of segregation in the South during the 60’s. It was alive and well and needed to be fought. Inadvertently, @onetree’s post addressed two subjects. I’m not a philosopher but I do have an interest in the subject, so I do some reading of it. @matthewmencel has posted this piece about the two schools within the study of knowledge, Rationalists and Empiricists. He describes the approach of each and then makes it very clear he’s championing Rationalists. Most interesting that when I visited, while there were many upvote, including mine, no one had started any discussion. This is page 2 of the Steem Mag posted by @infovore. Page 1 is up above. He started off with a really interesting interview with the founders of Blockpay. They talked about the role Steemians have played in the development of their platform, particularly in translating it to 44 languages. He then spoke to several newer members about how they feel about not making much on the site. They are willing to hang in to grow. Last but least, he wraps up with a recap of highlights of the changes on the platform this past week. I didn’t get over to the Facebook groups I’m part of yesterday. I’ll wrap up today with a look over there and then I thought I was going to get other things done today but, best laid plans. I did my bar duty at the branch. I expected it would be really quiet as we had the big dinner yesterday and it's Sunday of a holiday weekend. We had a card tourney on in the one room and some out of town guests dropped in so the clubroom was busier than I thought it would be. I found 17 links on the Facebook groups that I’d not already opened up. So, off to have a read. @lauralemons has written a raw and honest piece about the aftermath of physical and sexual abuse. It is worth a read to get her perspective on this important topic. Okay, I need to wrap this up if I’m going to get it posted today instead of tomorrow. But, I’m going to add this one last post as I really think it is good to finish with a smile and this is going to give you one. So, that's it for day two of my self-assigned thirty day challenge to write a post a day sharing the posts I've enjoyed on Steemit. Please click through to some or all of the links I've given you and give some upvote luv to the writers. awesome! Thanks for the link and shoutout! It does seem to be. It's pretty new but I like their approach.